In high school we learn that getting a degree is key for success, but are seldom taught how to manage finances such as filing taxes, credit card interest rates, and saving for the future. Unfortunately these are the lessons we learn the hard way; one in four student loan borrowers are either delinquent or in default, and 80% of Americans rely on someone else to translate tax forms for them. And terms like "Roth IRA" and "401K" might as well be gibberish. So why aren’t schools laying the foundations for financial success by teaching young people the basics about money management before it really counts? 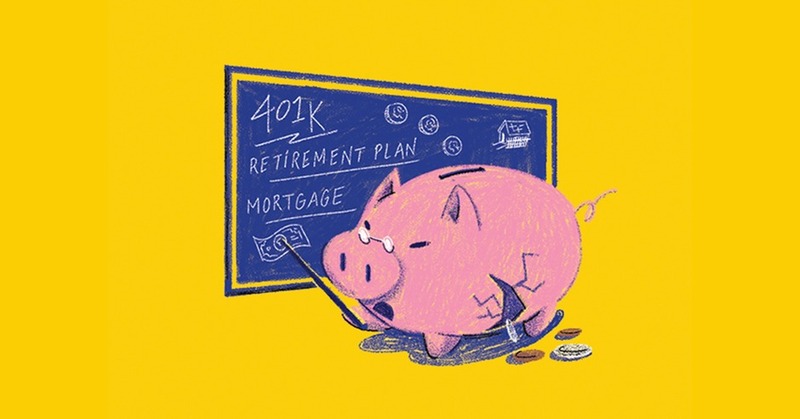 We asked financial experts and advisors why this is, and what they think could be the first step toward making personal finance a mandatory subject in American high schools. GREAT QUESTION. We've had several financial advocates on our show, and their answer is that it's a legacy issue: there are too many legacy topics that high schools teach to allow room for new material. It also is a problem now that begins at the top: because testing is largely mandated on a national level, testing needs to include financial literacy for schools to promote it, and currently testing doesn't include this area. Lately, though, there have been some big wins for schools. In Pittsburgh, for example, the authors of the [financial literacy] book The Missing Semester have worked with local universities, high schools and money management companies to create a student panel on financial literacy. This year was their third annual event. In Chicago, a group of students at the University of Chicago grabbed the financial literacy challenge head on and created Moneythink, a non-profit organization that helps mentor students toward better financial habits. It's coming, but we still have a long way to go. I can’t speak as to why high schools aren’t doing as much on financial literacy as might be desirable. However, I would offer that return on investment may be one of the most important financial concepts students should be learning in high school, because it is absolutely critical for making smart choices about investing in higher education. In its most simple form, ROI is nothing more than the ratio of your expected future earnings (above and beyond those made by someone who has only finished high school) to how much you spend on education and training after high school. But it demands that learners take the time to figure out two things: (1) how much do people who complete a specific certificate/associate’s degree/bachelor’s degree program at a specific college or university really make, and (2) how much will I really spend to complete my degree at that college or university. Unfortunately, for many students, finding the answers to these questions is difficult. Only a small number of states make it easy for the public to access college-specific, program-level (that is, “bachelor’s degree in organizational psychology from Texas Tech”) data on wages. AIR’s College Measures Project has been working with a group of states to make this data more available via consumer-friendly websites. Time and again, we’ve shown it pays to do your homework: in any given state, you’ll find short-term certificates that can propel learners into the middle class, bachelor’s degrees that lead to disappointing wage outcomes, and everything in between. The picture is better for students who want to understand their true cost of college—or at least it should be. The U.S. Department of Education requires that each college and university participating in federal student aid programs provide a net price calculator—a tool that helps a visitor to the college’s website move beyond the school’s advertised “sticker price” and receive a more personalized estimate of their costs after grants and scholarships. The Department also requires institutions to publish average net price for first-time, full-time undergraduate students based on income bands. Unfortunately, not enough students know about these tools and never find out just how affordable some colleges can be. As a result, some students don’t enroll at institutions that can represent a great value, particularly in terms of ROI. And some students don’t enroll at all. Financial Educator and founder of SF Money Coach. Personal finance should definitely be a requirement for graduation for high school students. In a year-long course, students could learn the basics of budgeting, balancing a checkbook, healthy credit card use, avoiding the debt cycle, multiple levels of savings, taxes and even salary negotiation. These are critical skills for adults. The curriculum would need to be very practical, hands-on and fun, as well as appropriate for teenagers, i.e. “So your allowance is $20 a week…" I have many clients who come into money coaching in their 20’s all the way through their 70’s who never learned these skills, and we start from scratch with the ABC’s. The world would be a different place if 20-somethings entered the workforce with financial competence. I don’t think personal finance is something that people want to be taught. There’s no arguing that there is a need for it, but if you offer the class would you make it mandatory? I think people want the financial results, but I don’t think they are willing to necessarily learn the basic fundamentals of managing their own finance, especially at a high school level. Managing debt is an intangible and nebulous concept to somebody at that age; high school students can learn about it, but because they can’t put it into action they will likely struggle to understand it. I don’t think it’s an issue of literacy or a lack of education about money, it’s more of a behavioral issue. I doubt that teaching someone not to spend money buying coffee every morning because it’s a waste of money is the answer. That’s not necessarily going to impact change in the typical person. I think that the instant gratification culture that we experience today is very counter to a lot of the fundamentals of sound financial planning, because, in order to set aside money for the future, you really need to forego the use of that money now. THESE QUESTIONS need to be addressed from a big picture view with a new approach and understanding for teaching financial literacy. Not just in high school but beginning at a younger age. If you consider that our nation’s overall financial literacy “score” of adults is just average; in other words, only about 40% of adults scored positively on basic financial concepts. It stands to reason that there are, statistically speaking, the same limited number of teachers who feel comfortable teaching on this subject. That’s one challenge. Then, among high school students tested throughout 18 countries, we scored merely at 12th place. The handling of money, budgeting, credit, interest rates and investing are a crucial skill set that needs to be recognized as critical to all individuals in this country, yet we don’t adequately emphasize its importance. There also needs to be a concerted effort and collaboration with teachers to augment their work in the classroom by parents starting to actively teach children about money. Perhaps if more parents understand that they rank as the single biggest influencer on children’s money habits, we can consciously make these lessons constructive? Teaching both the good lessons and also what can be learned from money “mistakes” we all have made. Culturally, we still have residue of norms that don’t fit today’s world, like [the assumption that] "women don’t need to deal with finance. That’s what men are for." Fortunately I see younger generations not falling for this outdated mentality and wanting all the tools that can make us more competitive, whether for the work force or for entrepreneurship. Framing the discussion with the knowledge that improved financial literacy impacts us not only on an individual level, but also as a nation in terms of our general economic output and competitiveness can also help to move the needle on this topic. It’s going to take collaborations and new approaches to teaching these skills in a more concerted and continuous manner for some real momentum to occur in this area of education.